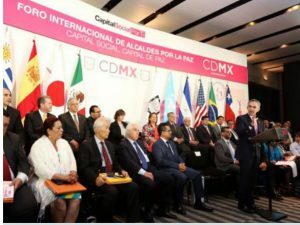 Prime minister, Miguel Angel Mancera, opened the International Forum of “Mayors for Peace” aimed at combating violence worldwide. The capital is a vice-president of the non-governmental organization “Mayors for Peace”, which involves 132 cities in 161 countries. 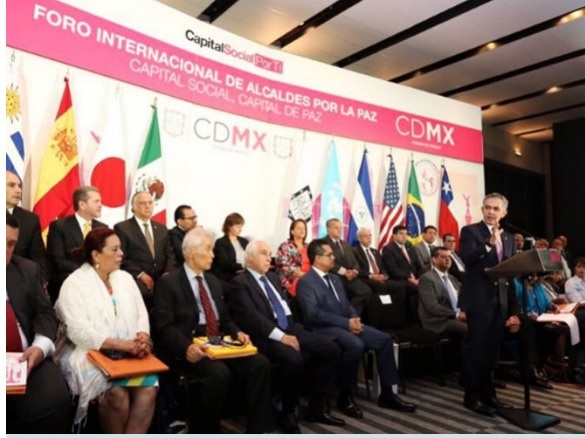 The event, organized by the Secretary of Social Development of the capital, called for the promotion of peace and eradication of violence in the world, through actions such as voluntary disarmament and social inclusion. He said a permanent task is to build more egalitarian cities, where conflicts over lack of inclusion are avoided: “how to prevent violence is by avoiding the causal conflicts and by developing a long-range program that involves the environment, access to water, food and education. Regarding the environment his government is working with the Climate Leadership Group (C40), and has joined the Food Policy Agreement of Milan to favor the creation of fair and sustainable food systems. During this forum, which is held during the International Day of Peace, five working groups and the keynote address will be developed. In addition there will be demonstration of the destruction of weapons collected by the program “For Your Family, Voluntary Disarmament” and the exchange of war toys for educational toys. Roundtables during the first day of work will incude: “Practices of Local Governments for a Culture of Peace”; “Challenges of Local Governments faced with new threats at the Global Level” and “The Role of Local Governments for Peace Building in Latin America and the Caribbean”. Speakers at the forum include the coordinator of the Global Network of Safer Cities UN Habitat; the mayor of Frogn, Norway, Thore Vestby; and the director and representative of the United Nations Educational, Scientific and Cultural Organization (UNESCO) in Mexico, Nuria Sanz. In addition, the director of Peace Boat, Kawasaki Akira; the Mayors for Peace coordinator in North America, Jackie Cabasso; the representative of the United Nations High Commissioner for Refugees (UNHCR) in Mexico, Mark Manly; and the representative of Granollers, Spain, Carme Barbany. Also participating are the mayors of Cartago, Costa Rica, Rolando Rodriguez; Managua, Nicaragua, Daisy Torres; the Alderman of San Jose Costa Rica, Fernando Jimenez and Professor at the National Pedagogical University Paolo Pagliai.